What do toothpaste, perfume, soap and ink have in common? The surprising answer is turpentine. This versatile byproduct of the pulp- and paper-making process is used in a wide range of everyday products. Consider a typical day: You wake up and brush your teeth. Then you take a shower using your favorite soap. After you get dressed, you apply some makeup or a spritz of cologne or perfume. You might not have realized it, but before you left home this morning, you used a number of products that contain a special form of turpentine that Domtar makes. Your perfume’s floral fragrance and your toothpaste’s minty freshness originated as crude sulfate turpentine, a USDA-certified, all-natural and renewable byproduct of the pulp- and paper-making process. In fact, many of the scents and flavorings in products you encounter every day are derived from byproducts of the pulp- and paper-making process. Our network of 13 mills in the United States and Canada yield a number of biomaterials, including crude sulfate turpentine, that refiners and manufacturers use to make flavors, fragrances, soaps, lubricants, inks and other products. “The average person comes into contact with a crude sulfate turpentine-derived product about 85 times a day without even realizing it,” says Dale Mitchell, director of business development for Domtar Biomaterals. But before it makes its way into your favorite products, this byproduct has to be processed. Customers who buy our crude sulfate turpentine fractionate it into alpha and beta pinenes. Those are the aromatic compounds that give flavor and fragrance to hundreds of food, personal care, and health and beauty care products including fine fragrances, cosmetics, air fresheners, insect repellants, chewing gums and flavored potato chips. Each year, we produce more than 1 million gallons of crude sulfate turpentine at our Ashdown, Dryden, Espanola, Marlboro, Nekoosa and Plymouth mills. We collect this byproduct near our digesters and condense it into liquid, which we sell to refiners by the gallon. “Crude sulfate turpentine has been around a lot longer than you or me, and its wide range of uses is pretty incredible,” Mitchell says. 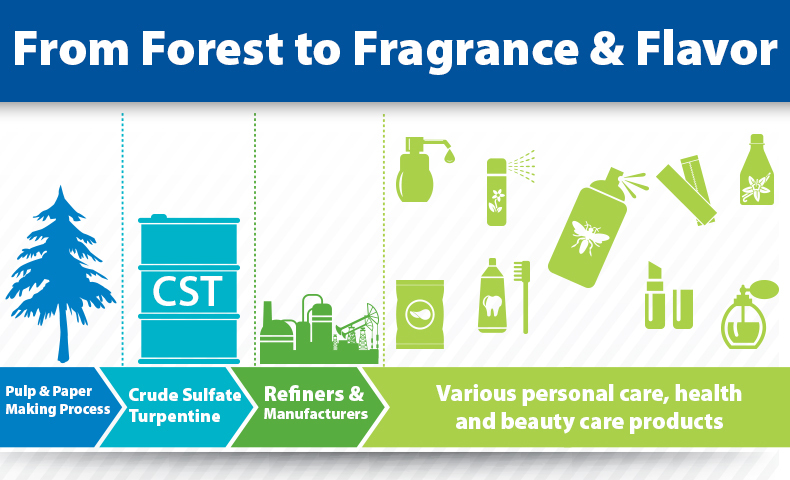 Crude sulfate turpentine is just one of many creative and sustainable ways that we use every part of every tree we harvest. So, the next time you’re walking the aisles at your local grocery store, try to count the number of products that originate in the forest and are made possible through the pulp and paper industry.